I needed a little "Thank you" gift for my D-I-L, daughter and one of her friends and I wanted something unique. My B-I-L buys and sells depression glass and he had given us these vintage teacups and bowls. A while ago, I had seen on another blog (sorry I can't remember whose!) a cute little teacup with a variety of plants planted inside. So, I dug out my vintage teacups after deciding I could do the same. First I painted the sticks I used for the "Thank you" sign. The sticks I used were sticks I had picked up for caramel apples. Then I cut my sign using my Cricut. 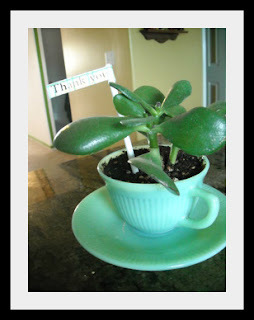 I purchased a small house plant and transferred that to the teacups. The green teacups and saucers also had bowls with them. So, I filled the bowls with Catchall Bars and wrapped it all with some plastic wrap. Then topped it off with a bow. I think they turned out great! I would love to get a thank you gift like that, so I know your family members are going to love them! Hi! These are so dang cute! I love the color! I found you on the blog hop and just wanted to let you know that I am your newest follower! I would love to have you stop by and visit our blog! We also host a link party every Saturday and would love to have you link up any of your posts! It is very beautiful potted plants. Those are great! I've got some vintage teacups and such that I could use for stuff like that. That is such a good idea! I have a set of those cups! Oh they are so adorable! We were just cleaning out our basement and found a box of mismatched teacups, saucers and bowls. 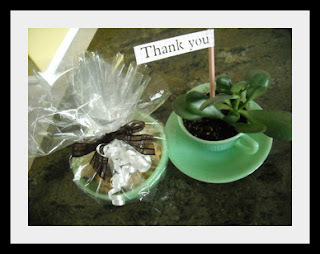 I'm a great fan of vintage teacups, and I love your idea of turning them into thank you gifts! What a cute idea! Never thought of doing that with a teacup! I am so amazed at what people are able to think of when I can't do a darn thing except read and write! I was already following you on GFC, Twitter and Facebook but wanted to follow thru RSS Feed this week. I hope you can swing by and follow also when you get a chance. Thanks so very much and have a great weekend. New follower from the blog hop. Love your blog! Wow! If I received a Thank You like that I would be so tickled. That is such a wonderful idea. Thanks for the tutorial. Thrift stores are a great way to find cute tea cups. I didn't think of yard sales though--thanks for the tip. I love my Cricut machine exactly for these types of projects. And they have some terrific deals going on right now. Share the love: Create with Cricut!